The (Mt. Townsend Creamery Trailhead) cheese stands alone. Your favorite? Everyone has his (or her) favorite cheeses, and mine change regularly. One day it’s the jalapeno cheddar from Estrella Family Creamery in Montesano (as fine a farmers market purchase as one might pray for). The next it’s Sottocenere from Northern Italy (which met my tantalized tongue for the first time at Queen Anne’s Brico della Regina Anna). Or the St. Marcellin I first enjoyed in its mother country (sold in reuseable earthenware rounds). Trailhead is our mountain cheese. 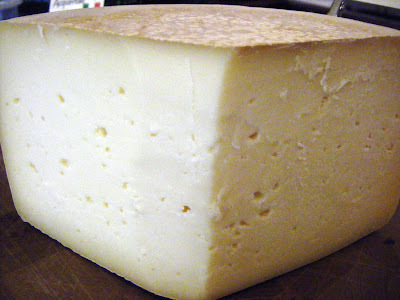 It is a rustic, medium-hard whole milk cheese that is mellow, rich and versatile. Made by hand in six pound wheels, it is pressed and brined before being washed in a mixture of saltwater and yeasts for its first two months. After four months it develops a distinctive natural mold rind, and its develops its full nutty flavor. At six months Trailhead becomes dryer, with a bit of sharpness. Trailhead is complex enough for cheese plates and sturdy enough for trips in the backcountry. My verdict? Mellow, yes, but I like it, too! 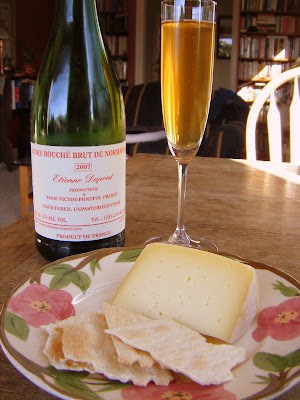 And the nuttiness was a great complement to that elegant apple juice from Normandy. 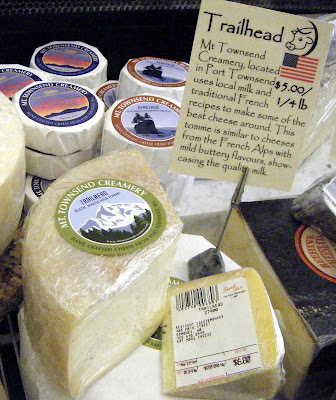 So, tell me: What’s your favorite cheese — and where can we find it?